Where do all the ideas come from? Welcome to Day 6 of the Quilt Retro Launch Party! Today I want to talk to you about that allusive subject: inspiration! Chinese Gong is a really cool, art deco kind of pattern. I’ve admired it for a long time, but never figured out to do with it. It seemed like the more I played with it the less I could think of a design that was appealing. 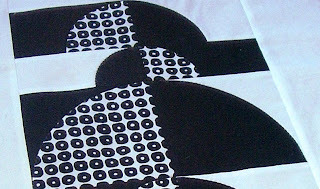 That’s when I usually have to walk away from a project, but I really, really wanted to make this pattern! Chinese Gong block - very Art Deco! This is my first try at this quilt. Not inspiring at all to me! So I did something I don’t usually do, I decided to plow on and see where the process took me. The first decision was to go ahead and prepare the semi-circles for the appliqué (even though I had no plan for what to do after that!). I did know I wanted to make them in shades of gray with black. As I got each shape done, I stacked them in a pile with the largest on the bottom, the medium in the middle and the smallest on the top. There they were, finished and all stacked like this on my ironing board – later, I actually did a double-take as I walked passed all the stacks! They looked so interesting that way. Very retro, too! So, why not stack them instead of placing them side-by-side!? That was the spark that I needed to turn this ho hum quilt into a brilliant one! That one brainwave broke the flood gate of possibilities open. Just a hint of the final version. You can get a glimpse of the difference stacking the semi-circles makes! Next I experimented with color – updated harvest gold and avocado green! Perfect! Why not add in orange to balance out all the cool colors with a warm one? Great! How many blocks? And odd number for sure – why not 5? Wonderful! The ideas literally came faster than I could implement them! When all was done, I had this really intriguing quilt that I just couldn’t take my eyes off! It’s by far my favorite quilt in the book! In the end, what I learned from designing this quilt was to not give up on something that I really want to do and keep my eyes open for that spark that can come at any time in any way - even if it's sitting on my ironing board! Today I want to introduce you to Jacquie Gering of Tallgrass Prairie Studios. She is another one of those quilters who probably can’t define inspiration, but her quilts are definitely inspired! 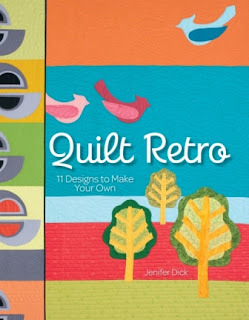 She is the author of the new book: Quilting Modern: Techniques and projects for improvisational quilts. I can’t wait to get my copy! I met Jacquie at the KC Modern Quilt Guild and she was so nice and supportive from the second she met me. I couldn’t believe how gracious and generous one person could be! Check out her blog to see the whole Dinner Bell quilt! way to go! i like that idea ... to see one thing and make it a different way. patterns are just that: an idea put on paper, not written in stone. have fun making your 'pattern'!